In each Transitions section of Preservation magazine, we highlight places of local and national importance that have recently been restored, are currently threatened, have been saved from demolition or neglect, or have been lost. Here's one from Fall 2017. Completed in 1908, Unity Temple in Oak Park, Illinois, was designed by Frank Lloyd Wright for the Chicago suburb’s Unitarian Universalist congregation. This past June, it reopened to the public after a three-year, $25 million restoration. 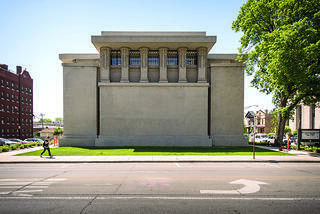 Work on the temple was funded by donations and grants, including a $10 million gift from Chicago’s Alphawood Foundation and $1.75 million from the congregation. Wright referred to the temple as his “little jewel box,” and a major part of the project involved restoring the building’s art glass, including windows and light fixtures. “We took this opportunity to bring everything up to the same level of quality,” says Gunny Harboe of Harboe Architects. The glass pieces, some of which had been poorly repaired in the past, were catalogued, crated, and shipped to Judson Studios in Los Angeles for restoration. In addition, Harboe and his team spent about a year developing techniques to repair cracks in the building’s plaster interior and concrete exterior. The addition of nine geothermal heating and cooling wells will provide the temple with air conditioning for the first time in its history.